Puccini’s Madama Butterfly is one of the most beautiful, tragic love stories in opera history. It’s also rife for modernisation and reinterpretation, as the exceptional Miss Saigon can attest to. 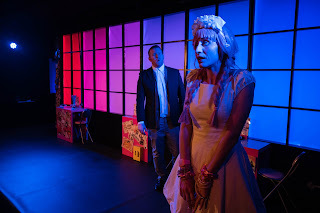 One particular area of interest is the ambiguity in Lieutenant Pinkerton’s true feelings for the young Butterfly, something that’s brought to the fore in this modernised version at the Kings Head Theatre, directed by Paul Higgins. 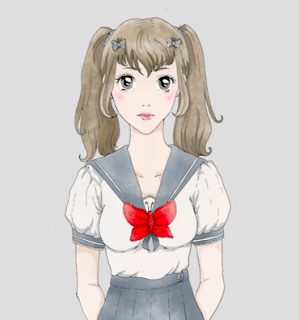 By transferring the opera to present day, Higgins hopes to highlight Japanese patriarchal society and the over-sexualisation of school girls. Here, Matthew Kimble’s Pinkerton is a sleazy American permanently attached to a bottle of Jack Daniels. He prays on the youthful Butterfly (Becca Marriott) with a smarmy grin, she dressed in girlish Harajuku fashion. It certainly adds a new angle to the opera, but it’s an uncomfortable watch. “I want you to love me, to love me very gently, to love me like a child,” sings Butterfly, in this new translation from Amanda Holden. From the characterisation, there’s a disturbing disconnect between the intentions of Pinkerton and Butterfly. Just as Pinkerton shows a lack of respect for Japanese culture – laughing at her traditions and frequent bows – so too does Higgins. Only last month Notting Hill’s Print Room theatre was accused of “yellowface” for its all-white cast. It’s a topical issue and whilst Higgins may have good intentions for this production, the casting feels out of touch with current politics. What’s worse is the cartoonish characterisation. The inspiration may be Japanese manga comics, but from the pursed lips of Sarah Denbee’s Suzuki to the comically wide-eyed innocence of Butterfly, it feels more like playing on stereotypes for laughs rather than a profound use of modern cultural identity. As Marriott shuffles around the stage, bows and flutters her eyelids whilst clutching a Hello Kitty doll, it utterly undermines any sense of drama or tragedy. Indeed, a few bright neon colours and a shuttered backdrop do not represent the varied cultures of Japan and its mix of advanced technology and honourable tradition. The modern setting adds little to this production, even whilst there may be some truth to the interpretation. The second half does improve as the performance becomes a more straightforward tragedy, but it’s not enough to undo the damage of the first. It’s simply not credible that this reinterpreted Pinkerton would ever return, that he would suddenly have a conscience, or that he should have any form of redemption. And, when Butterfly and Suzuki complain of their lack of money, why is Butterfly seen listening to an iPod? Hasn’t she heard of eBay? There is some fine singing here even with the miscasting, Marriott hitting all the right notes despite the characterisation and Sam Pantcheff singing a rich baritone as US consul Sharpless. Puccini’s score is reduced to piano and cello, but sadly musical director Panaretos Kyriatzidis and cellist Alison Holford struggle to contain a whole orchestra beneath their fingers. Where so many opera productions cling to tradition, it’s brave of Higgins to bring something new to this beloved work – something the Kings Head Theatre is well known for. Yet in today’s highly politicised world and climate of ethnic sensitivity, this production is sadly misguided. Watch: Madam Butterfly runs at the King's Head Theatre until the 18th March.